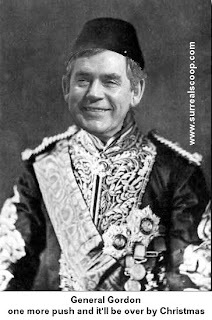 General Gordon Brown today rallied the troops of the British economy with a stirring battle cry certain to revitalise morale after the unexpected news that the British Expenditory Force had not seen a recovery in the nation’s fortune. General Gordon was responding to recent news of the reversals in performance of our chief economic allies, France and Germany, who have seen their prospects improve by securing victories in the battle against malevolent recessionary forces. General Gordon said that it was vital that everyone understood that they had their role to play in the latest push forward to secure success on the international business battlefield. The General also took time to respond to allegations that a further set-back might lead to a spiral of failure and reduction in morale that it would be impossible to recover from. The General, through another commanding oratory, reminded us that last year he had succeeded in saving the world and re-iterated that all that was needed to secure Britain’s future was one more valiant charge.